Master thief John "The Cat" Robie (Cary Grant) is spending the evening having drinks with wealthy American Jessie Stevens (Jessie Royce Landis) and her attractive daughter Frances (Grace Kelly). Throughout the evening, his attention remains focused on the older lady's jewelry, which would attract any respectable villain. However, Robie has supposedly given up his trade long ago for a simpler life in the French countryside. A string of high-level robberies have occurred recently, and the authorities believe that "The Cat" has returned to prominence. Is Robie really trying to catch a new mastermind, or has he returned to his past role? Frances hardly utters a sound throughout the evening, but she will make the night's final statement. Robie is completely stunned when she plants a kiss on his lips before entering her room. Without uttering another word, the lovely young woman shuts the door and retires for the evening. This sequence perfectly exemplifies the charming elegance of To Catch a Thief�an enjoyable romp through France with two of my favorite movie stars. Director Alfred Hitchcock brings his trademark style to the proceedings and engages us with a multi-layered plot. The early scenes involve Robie eluding the police, who have few doubts about his guilt. After drawing us into the mystery, the enchanting story quickly switches gears and concentrates more on the burgeoning love betwen Frances and Robie. The multiple elements intersect nicely throughout the picture, which contains plenty of impressive direction. During one inspired chase, the camera pulls backward into a helicopter shot and reveals the scenic grandeur of the area. While removing much of the tension from the sequence, Hitchcock enhances the beauty and reveals a more casual demeanor. Although the story is entertaining, the true attractions of this picture are Cary Grant and Grace Kelly. They convey tremendous chemistry on the screen, and the witty double entendres increase the connection. These comments could easily become ridiculous if overplayed, but the actors deliver them in a delightfully straightforward fashion. The subtle wordplay allows Hitchcock and writer John Michael Hayes to get away with much more than you would expect in 1955. The classic love scene and its fairly obvious accompanying fireworks provide one of the great visual metaphors in film history. Throughout the picture, Grant and Kelly venture to an array of colorful locations, and we remain with them at every corner. The story's abundant success would have been doubtful without their marvelous charisma. Often labeled "Hitchcock lite," To Catch a Thief may surprise the skeptics who view it simply as a romantic comedy. It may not feature the gripping suspense of Shadow of a Doubt or the stark terror of Psycho, but this tale remains viewable more than 45 years after its initial release. Supported by an excellent cast, Hitchcock takes a generic story and raises it to a higher level. Also noteworthy are Edith Head's inventive costumes, solid acting from John Williams and Jessie Royce Landis, and an effective musical score. After you finish screening the Hitchcock standards, don't forget to catch this entertaining film. Image Transfer Review: To Catch a Thief features the lush, bright colors of Southern France and attractive, gaudy costumes. This release contains an excellent 1.85:1 anamorphic widescreen transfer that has restored the film to a top-notch level. Minor defects do appear on the print intermittently, but they do not provide any significant distractions. The film's considerable age obviously will lead to some flaws, but the overall presentation is still remarkable and filled with energy. Audio Transfer Review: This release contains a restored mono track that improves tremendously over the typical VHS audio. The romantic score plays nicely through the speakers while Cary Grant and Grace Kelly drive through the rural France. It helps to generate the elegant atmosphere that makes this story so memorable. All of the clever dialogue is easily understandable and lacks the muffled nature of many older films. While lacking the depth of the newer 5.1-channel transfers, this track provides an enjoyable experience. Extras Review: Although not officially a special edition, To Catch a Thief contains an enjoyable collection of featurettes that complement the film nicely. Writing and Casting runs for nine minutes and begins with a discussion of the typical elements of a Hitchcock movie. His daughter Pat and granddaughter Mary provide much of the discussion, which covers Cary Grant, Grace Kelly, and the main supporting actors. We also receive some interesting material about the MPAA approval process, which was difficult due to the numerous double entendres. The most extensive feature is The Making of To Catch a Thief, a nearly 17-minute documentary about the actual production. Instead of giving us a by-the-numbers overview, this piece contains a series of entertaining vignettes. One especially fun segment concerns Cary Grant's desire to make changes to Hitchcock's initial plans. The director did not approve of these modifications, but found creative ways to make the star unaware of this impression. It also reveals a possibly different ending, which was removed during shooting. Alfred Hitchcock & To Catch a Thief: An Appreciation offers a more intimate portrait of the happy person behind the director's serious facade. We observe glimpses of home movies showing a young Pat Hitchcock playing with her jovial father. The featurette also presents the underappreciated sense of humor in his films and its appearance in this movie. Another nice inclusion is the Photo and Poster Gallery, which appears in a seven-minute slide presentation. I dislike scrolling through countless menus to find a few charming photos, so this format is an enjoyable variation. The pictures include excellent black & white shots of Grant, Kelly, and Hitchcock, as well as marketing posters from around the world. Fashion design enthusiasts should enjoy Edith Head—The Paramount Years, an intriguing biography of the renowned costume designer. We learn considerable information about her background and the films that made her famous. Head's favorite picture was To Catch a Thief, and she truly enjoyed working with Hitchcock. This disc also includes the original theatrical trailer, which appears in an acceptable full-frame transfer. Silly narration accompanies shots from almost all the key scenes, but it promotes the movie effectively. I still possess fond memories of viewing Hitchcock classics like Rear Window and North by Northwest with my parents as a child. 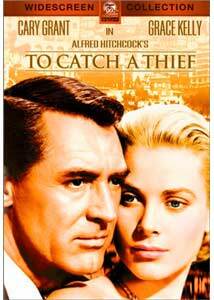 However, I did not discover the charms of To Catch a Thief until a few years ago. Although it does not rank among the director's most complex works, this engaging picture is one of his most enjoyable films. Cary Grant and Grace Kelly both deliver shining performances, and the picturesque French countryside provides the perfect backdrop for the stylish mystery.